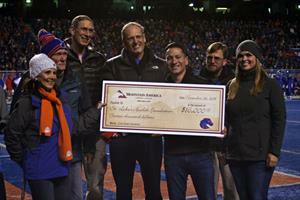 BOISE, Idaho, Dec. 06, 2018 (GLOBE NEWSWIRE) -- As the official preferred credit union of the Boise State Broncos, Mountain America Credit Union committed to make a donation to a charity for every first down completed by the Broncos football team. This year, Mountain America continued its support of St. Luke’s Health Foundation, the philanthropic arm supporting St. Luke’s Children’s Hospital, as the recipient of the Mountain America First Down Donation program. As a result, Mountain America Credit Union presented $16,000 to St. Luke’s Health Foundation during the November 24 home game against Utah State University. Tim Toy and Angie Nelson, of Mountain America, presented the check to Sherry Iverson, St. Luke’s Children’s director of patient & family support services, Aaron Weiss, MD, Treasure Valley Pediatrics, and Tara Dombek, St. Luke's Children’s director of pediatrics, along with other representatives from St. Luke’s.